All our equipment and micropipettes are guaranteed for at least one year. Any repair or revision is carried out by Dominique Dutscher SAS. We answer all defects or product-quality problems (hardware or consumables). Dominique Dutscher relies on MC2, an independent provider of micropipette manufacturers and specialized in metrology, maintenance, repair, calibration and control of all micropipettes brands. This brands neutrality guarantees its impartiality. A fast and professional service, a recognized competence in metrology. 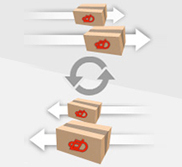 Merchandise exchange or returns, Delivery problems? The product does not suit you ? Have the products been delivered to you damaged or with a defect? Is your delivery package damaged ? information upon receipt on the day of delivery, or at the latest within 48 hours. The terms will be given to you, and a RMA (return merchandise authorisation) number will be issued. - If the products are still suitable to be sold or if the return is not due to any of your actions, we will issue a credit note or exchange. - Otherwise the product will be returned to you or a restocking fee will be deducted from your credit note.